Union General Ulysses S. Grant embarks on another attempt to wrest control of the last major Confederate stronghold on the Mississippi River from the rebels; the fortress city of Vicksburg. Numerous other attempts have failed miserably. The ill-fated campaign from the north, short circuited by that devil Forrest's raid on Grant's supply lines. The jinxed canal, dug through the swamps in an attempt to bypass the city's guns. Now another plan is in motion. 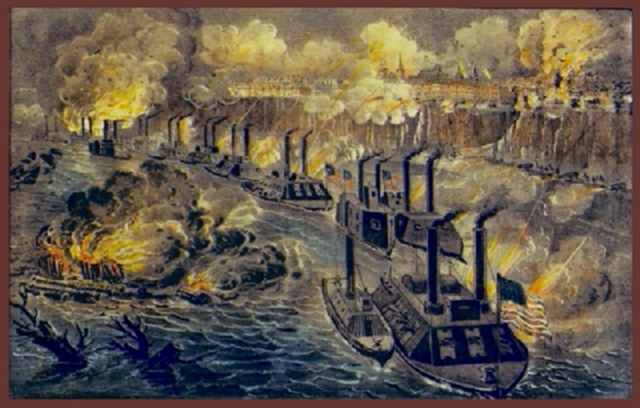 Grant will march his Army of the Tennesee through the Louisiana swamps, sneak his ships past the rebel fortress in a daring run of the gauntlet, conduct the largest amphibious invasion in U.S. history, separate himself from his supply base, wedge himself in between two rebel armies, and seize control of the city from the east! All the while battling politicians and public opinion as much as the Confederate armies. Somehow, his daring plan worked, and the Mississippi once again flowed unvexed to the sea. This operational level game uses the block unit system to re-create the limited intelligance of the actual campaign. Players maneuver their forces without adequate knowledge of their opponents strengths or even location. The game board spans the campaign topography, from the swamps of eastern Louisiana to the mountainous terrain around Jackson Mississippi. A point to point movement system is employed on a 20 x 24 playing map. Limited command abilities and critical supply wagons are key to managing your armies and achieving victory.